1. Add “UIAlertViewDelegate” to the header file whose implementation is going to show the popup message. Adding this protocol to your header file makes your code listen to the response from a popup message. UIAlertView *message = [[UIAlertView alloc] initWithTitle:@"Alert title"
[message release]; //We alloc-ed, therefore we have to release. //This goes in the implementation (.m) file UIAlertView *message = [[UIAlertView alloc] initWithTitle:@"Alert title" message:@"Alert body" delegate:self cancelButtonTitle:@"Button 1" otherButtonTitles:@"Button 2", @"Button 3", nil]; [message show]; [message release]; //We alloc-ed, therefore we have to release. On line 4 the delegate is set to “self”. That means the code in this implementation file is going to listen to the response from the popup message. On line 5 and 6 there are 3 buttons configured. 3. Now the protocol is added to the header, and the delegate is set in the alertview, we have to write some code to respond to the popup message! Guess you will have to create a modal view for a customizable popup. Should not be very difficult with the new XCode 4.2 with a storyboard and a “segue” . A seque can have as type “modal”. 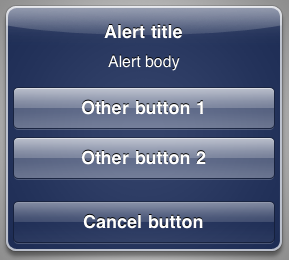 You would have to create the buttons and the response to the buttons yourself, but it would be completely customizable!